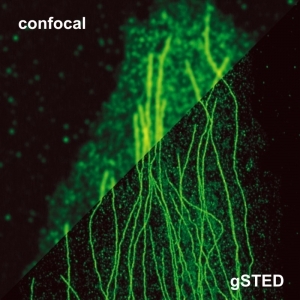 Stimulated emission depletion microscopy (STED) is a fluorescence microscopy technique that overcomes the diffraction limited resolution of confocal microscopes. The resolution enhancement is essentially based on switching off the fluorescence of dye molecules by stimulated emission using intense laser light in the outer regions of the diffraction limited excitation focus. This intense radiation causes almost all of the excited molecules to return to the ground state. 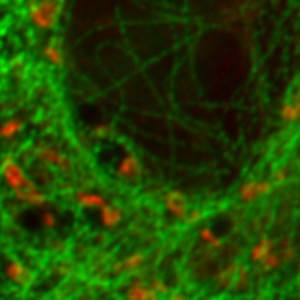 Fluorescence from the remaining excited dye molecules in the center of the excitation focus is then detected and used to form the high resolution images. 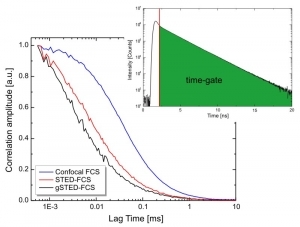 An even further resolution enhancement is possible by applying time gates to the collected data (gated STED or gSTED). As STED creates an effectively smaller observation volume, it can also be applied to other methods such as FCS. In that case, collecting data at different observation volume diameters can help to disentangle complex 2D diffusion scenarios in heterogeneous samples such as biological membranes. 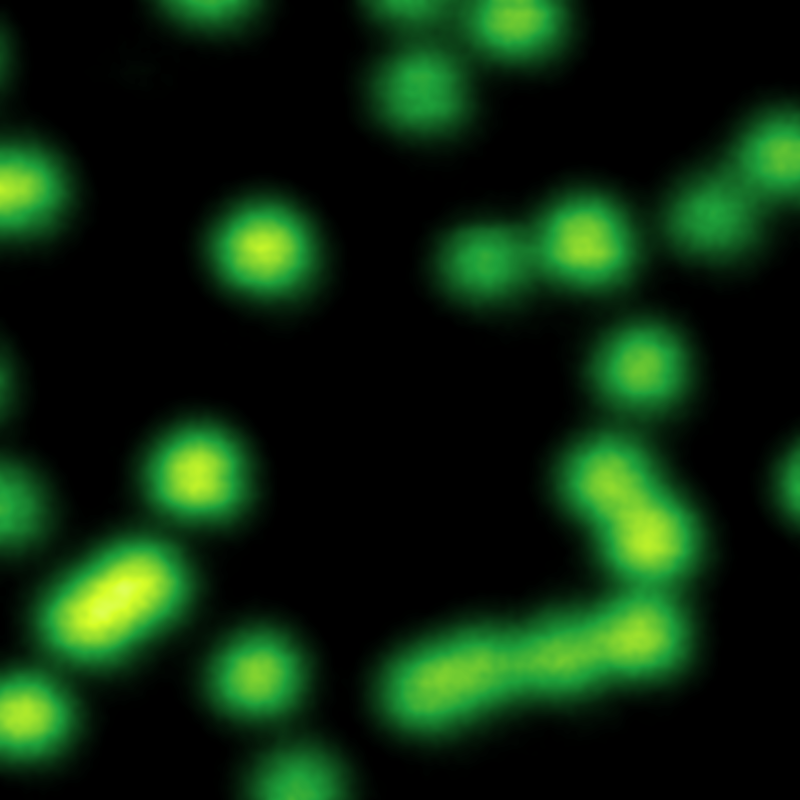 The STED method uses pairs of synchronized laser pulses. The first laser pulse generated by, e.g. 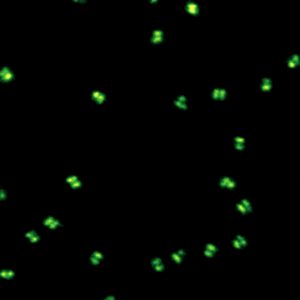 a picosecond pulsed diode laser, is used to excite the fluorescence dye and produces an ordinary diffraction limited focus. The excitation pulse is immediately followed by a depletion pulse, which is red-shifted in frequency to the emission spectrum of the dye. 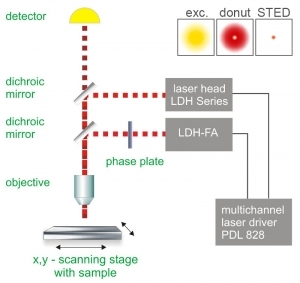 By spatially arranging the STED pulse in a doughnut shape using specially designed phase plates, only the fluorescence from molecules at the periphery of the excitation focus is quenched via stimulated emission. 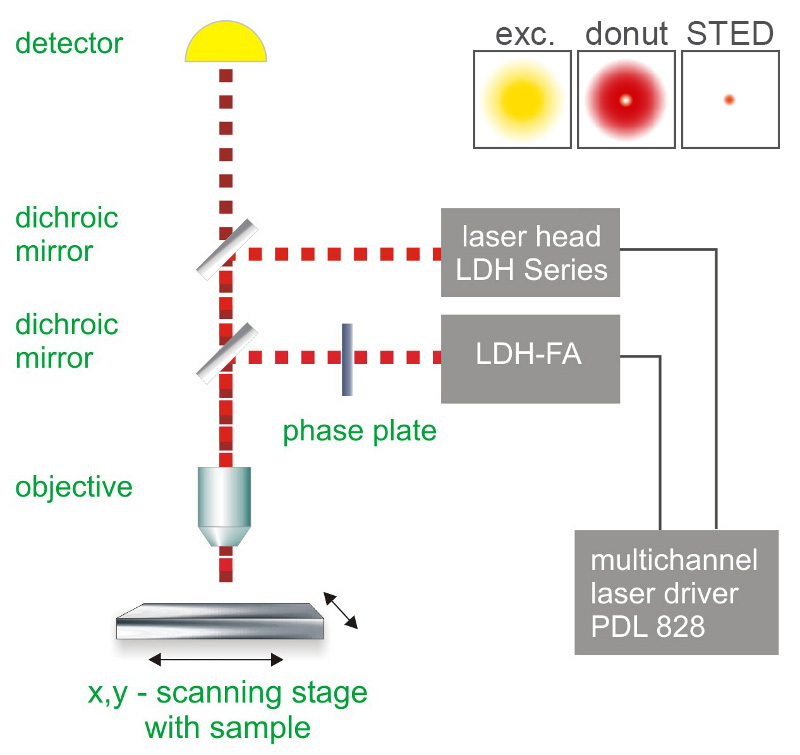 In the center of the doughnut, where the STED laser intensity is zero, fluorescence remains unaffected and is detected by single-photon sensitive detectors (e.g., Single Photon Avalanche Diodes, SPADs). 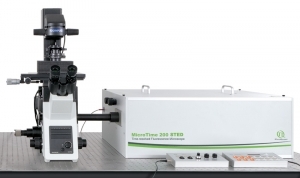 The MicroTime 200 STED is a powerful instrument capable of STED microscopy, Fluorecence Corelation Spectroscopy and its daughter techniques as well as Fluorescence Lifetime Imaging (FLIM) with single molecule detection sensitivity. 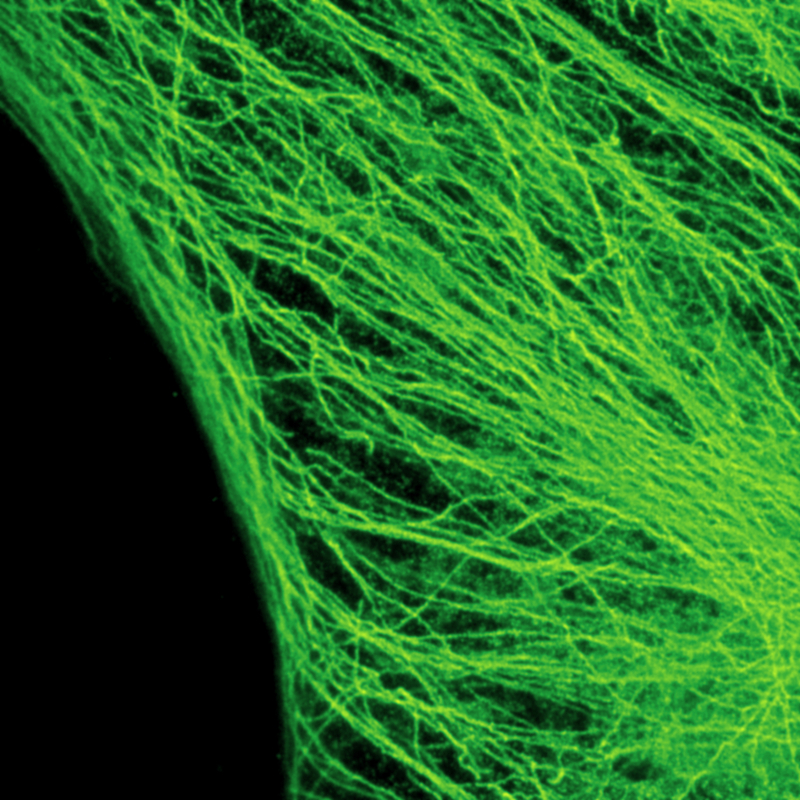 It contains the complete optics and electronics for recording virtually all aspects of the fluorescence dynamics of microscopic samples or femtoliter volumes and with a spatial resolution below 50 nm. 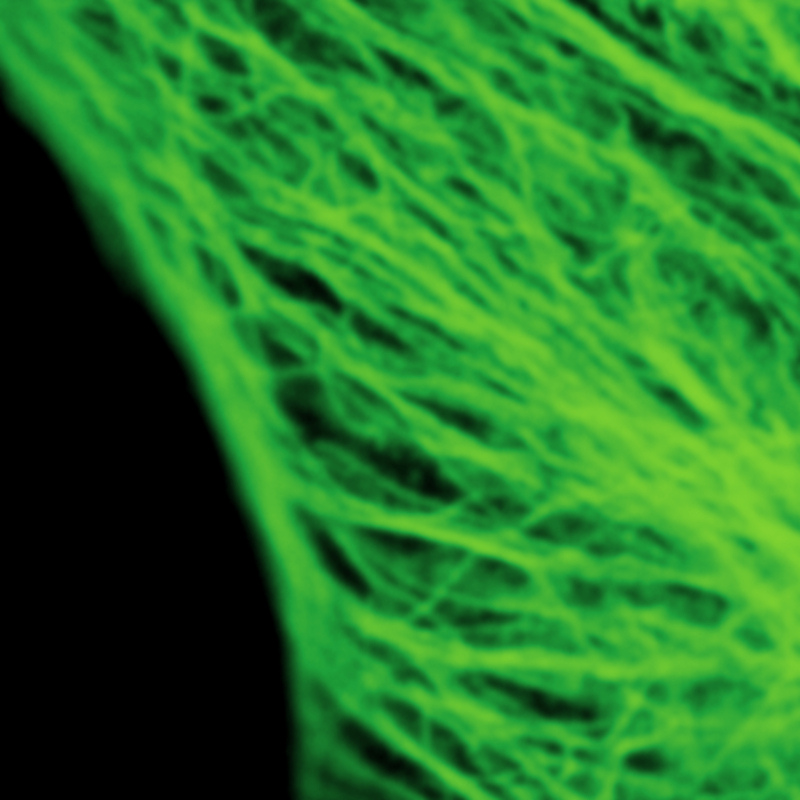 The instrument gains its exceptional sensitivity and flexibility in combination with unprecedented ease-of-use from a unique fusion of miniaturized and highly sophisticated state-of-the-art technologies. 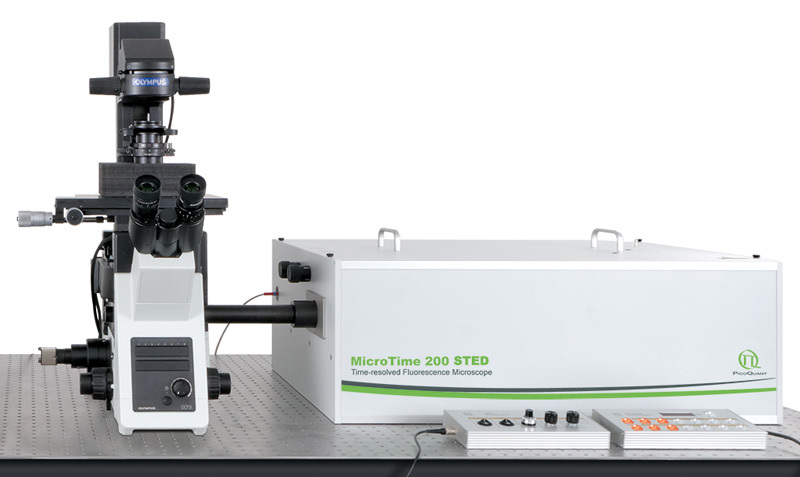 Although, these technologies enable to run an instrument of comparable complexity and power without having to spend more time on instrument maintenance than on original scientific content, the MicroTime 200 STED remains an open platform that allows the advanced scientist to easily built upon the open character of the instrument in order to realize highly customized applications. Two fluorescent species can be distinguished by pulsed interleaved excititation (PIE) with two slightly shifted wavelengths and detection of the fluorescence in two spectral bands. 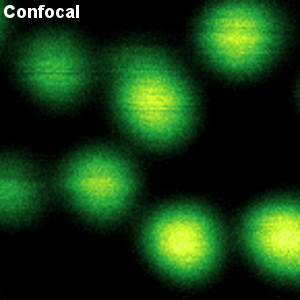 Fluorescence pattern matching was used to identify the contributions of each fluorophore. 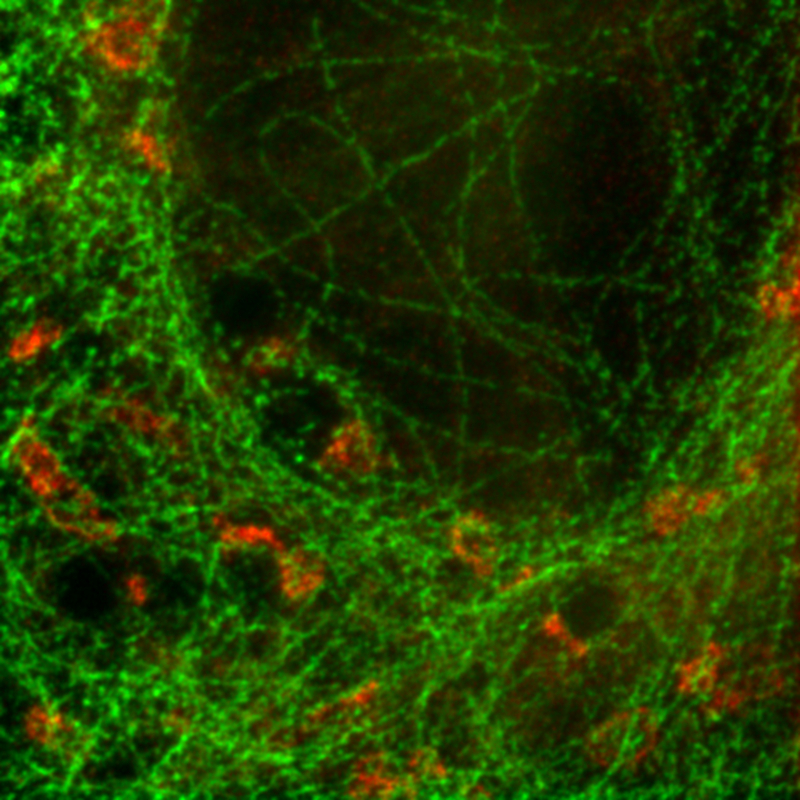 The example shows part of a U2OS cell labeled for tubulin with Abberior STAR 635p (green) and giantin with Atto647N (red) utilizing a single STED laser wavelength and excitation with two different diode lasers at 640 nm and 660 nm. 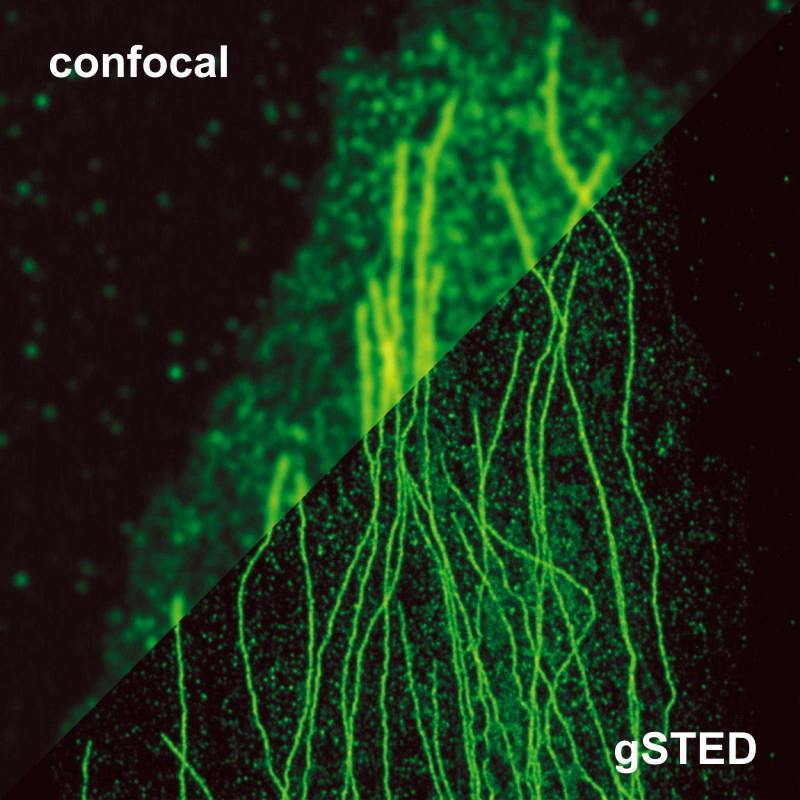 The example shows a comparison between confocal and STED images of Crimson beads (20 nm diameter) recorded at different repetition rates of the two lasers. The beads were excited using the LDH-P-C-640B and the LDH-P-FA-765 was used as STED laser. The upper parts of the images shows the beads imaged with a standard confocal setup, whereas the lower parts show the STED images of the same sample region. 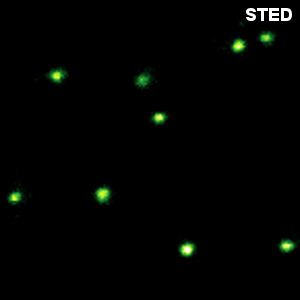 The resolution enhancement is clearly visible in the plotted cross-sections through one bead, with the STED images reaching a spatial resolution of approx. 50 nm. The example shows vimentin fibers stained with ATTO 565 via primary and secondary antibodies. The Solea laser has been used to excite the sample at 560 nm. 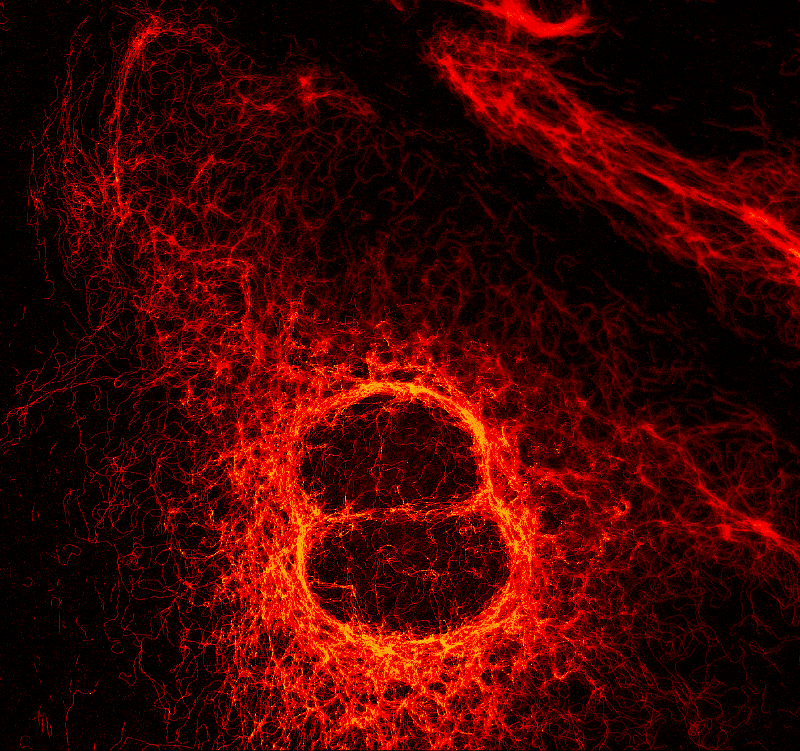 A lateral resolution of approx. 50 nm is obtained, which can be expected for a fiber with a diameter of 10 nm, covered by antibodies with a diameter of approx. 8 nm each.